They have gone and done it again! How did I miss this ice cream when it was introduced onto the market? According to the Daily Telegraph Del Monte Superfruit Smoothie created this purple "licence to chill" lolly back in 2009 after asking more than 1,000 women which male celebrity they would like to see on the end of a stick. 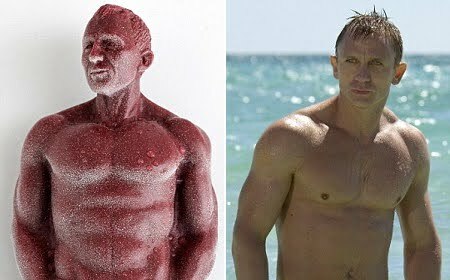 Apparently, they "worked tirelessly" to recreate a sculpture of 41-year-old Daniel Craig in the scene where he emerges from the sea in Casino Royale. The lollies come in blueberry, pomegranate and cranberry flavours and are under 100 calories each. Common decency prevents me from expanding on the subject through the reproduction of any of the photographs here. However, this modest discovery did kick off a bout of nostalgia for some of the more conventional ice creams of yesteryear. And there is even a website that can help to jog our memory. This site lists all the old Lyons Maid ice creams of the 1950s, 1960s and 1970s including the Wonder cake, which is hand made and consists of layers of pistachio, strawberry and vanilla ice creams inter-layered with slices of sponge cake.It wa decorated with creamy scrolls and glacé cherries and encircled with a gold band. Originally made for the catering trade they were put on sale to the public in 1952. 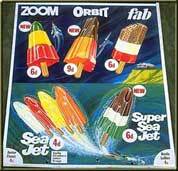 Far more familiar to those of my generation is the Fab lolly, which was designed primarily for the 3 million girls in Britain aged 5-15 and was based around Gerry Anderson's Thunderbirds TV series. Lady Penelope's Rolls Royce number plate was FAB 1. They retailed at 6d. One I don't remember is the Strawberry 'n' Pear (Take Home Bricks) ice cream. This was priced at 2/6 and consisted of strawberry ice cream rippled with strawberry puree, with a centre of pear water ice. It was the only pear-flavoured ice cream on the market and was designed for the take-home trade. There is much more, including the Pola bar, the super Orange Maid, the Cola Rola Ice Lolly, the Black Prince, Mr Merlin's Magic Purple Potion, the Pineapple Mivvi, the Haunted House, Captain Rainbow, Orange Maid, Mr. Men, Space 1999 and my favourite, the Strawberry Mivvi. There are times when I wonder why some items are regarded as news and this is one of them. For some reason the Taxpayers Alliance has submitted a Freedom of Information request so as to find out the web browsing habits of employees of the Department of Transport. The DfT spokesman is at pains to stress that personal internet use by staff should be restricted to official breaks. The BBC say that amongst the interests of the civil servants are belly dancing, Doctor Who and the Roman Empire. The BBC website came top (of course), but employees are also spending time apparently shopping, gambling and house-hunting. So not much different to anybody else. Then again: But there are a number of unusual sites which reveal some more unexpected pastimes among civil servants. Coming in at number 385 - with 27,634 hits - is bearsfaction.org.uk - a website run by the Lorien Trust which organises fantasy role-play festivals. It invites users to "leave reality behind" and "walk amongst goblins, elves and dwarves". Even more popular, coming in at 115, is etiquettehell.com which gives frustrated sticklers for good manners a forum in which to vent. Smallworldbellydance.com - a south London belly dancing studio - gets 3,170 hits, while a website for fans of the Roman Empire attracted nearly 100,000. Some civil servants also seem to be interested in matters of glamour within Whitehall itself. Sexymp.co.uk - where users get to rank Members of Parliament in order of attractiveness - got 21,477 hits in the five-month period, making it the 465th most popular site. I wonder which sites the Taxpayers Alliance like to browse in their spare time. To be fair to Lembit Öpik he is a good communicator when he tries as this article on Alex wilcock's blog makes clear. What do the Lib Dems uniquely stand for? The Lib Dems' unique quality giving a voice to the voiceless, and defending citizens against conformity and ignorance. Other parties tend towards being authoritarian, and a blown by fashion to make knew jerk policy in crises. the Lib Dems at their best resist those superficial tendencies and cherish freedom and fair distribution of wealth in the party's political heart. Why should people vote Lib Dem? People who care about righting the wrongs of financial and power imbalance in our communities should vote Lib Dem. People who believe politics can stand up for those who do not enjoy great wealth or political might should vote Lib Dem. Quite simply, if you're someone who cares about people, not just yourself, the Lib Dems are the natural and logical choice. Wales PLC drifting in deep water? It is difficult to disagree with the Welsh Conservative's Economic Spokesperson when he says in this morning's Western Mail that the Welsh Government's business and enterprise department has “left Welsh business in limbo” and that major decisions have been “kicked into the long grass”. He has hit the nail on the head when he adds that: “At a time of economic uncertainty, the last thing the business community needs is a sluggish Economy Department intent on treading water rather than providing swift and efficient responses to the needs of Welsh businesses"
“Since her appointment in May, Mrs Hart has been undertaking an extensive programme of meetings and dialogue with business leaders, entrepreneurs and industry professionals from across Wales to fully understand their needs and views. “This approach of direct engagement has already been widely welcomed and applauded by the Welsh business community and its leaders. Obviously the Minister needs to settle into the job, but it is not as if she is new to Government. Indeed she was a member of the Cabinet for the entire period that the One Wales' Government's Economic Strategy was being formulated and agreed. She has collective responsibility for that and surely she sees that it is necessary to react quickly to developments on the other side of the border so that Welsh businesses do not get left behind. Yesterday for example it was announced that Bristol and Birmingham will be hosting Enterprise Zones. Unless we get to grips with our own policy on this then we will find jobs being sucked out of Wales. September is a long time to wait for some sense of direction on this Government's economic policy. In business terms it is an eternity. Today's Guardian has an excellent new parlour game in which they rewrite the plots of classic movies by adding in modern technology. In truth it is a just a new slant on the Orange cinema adverts that urge us not to let a mobile phone ruin our film viewing experience. Before checking into the Bates Motel in a deserted California backwater, Janet Leigh consults Trip Advisor on her iPhone and reads: "Smelly, dirty, really creepy owner, constantly talks to a mother no one ever sees. Filthy shower, manager's office smells of stuffed birds, no Wi-Fi. Often travelling alone on business as a cutting-edge website designer, I foolishly checked into the Bates for a night with a gift voucher my ex gave me, and let me tell you, I spent 10 sleepless hours with the chest of drawers propped up against the door, sharpening my toenail clipper, terrified that the owner was going to come in and hack me to pieces with a butcher knife. Oh, another thing: No cable." So Leigh doesn't check into the hotel, there is no horrific shower scene, and Psycho does not become a classic. You can't get somebody to strangle your wife to death with a phone cord anymore because nobody under the age of 70 still has a land line. Since it would take a long time to beat somebody reasonably fit, like Grace Kelly, to death with a mobile phone, the murderer tries to do it with a portable shredder, but she bludgeons him with her iPad. Or with a totally out-of-date netbook she happens to have lying around. Or with the server she uses to store all the music from her old vinyl records. Or something. It is getting to the point where the appeal of classic cinema films lies in their quaint old-fashionedness rather than the quality of the writing, acting and directing. Who polices the spending police? Yesterday's Telegraph contains a fairly run of the mill public spending scandal story about the Audit Commission. Frank Noon, a corporate photographer, was hired to take pictures of a number of events for the commission, including shots of its 25th anniversary celebrations. His photographs also included images of special “alumni” events organised for current and former staff. Mr Noon took photographs of staff at the BT Tower, Savoy Place, Lancaster House and the Reform Club. It is just as well they are being abolished, though the timing of these latest revelations does seem to be quite convenient. Speaking to the Guardian, he said Labour needed a vision for the future but that it "is not going to come from the sort of populist, anti–immigrant, Europhobic, anti–globalisation language used by Blue Labour". In an implicit criticism of Ed Miliband, he said: "The problem with killing off New Labour and putting nothing in its place is that it leads us to clutch at straws and grab at any passing sentiment. This is what has happened with Blue Labour which seeks to reconnect the party with its old, postwar, apparently white and male, industrial working-class base. These people have moved on, to other jobs, to other aspirations and, in the main, to an entirely different identity." Mandelson appears to fear that Ed Miliband might be willing to make Blue Labour's thinking central to his own policies. Given the way that New Labour embraced some of this thinking it seems that his fears may well be justified. 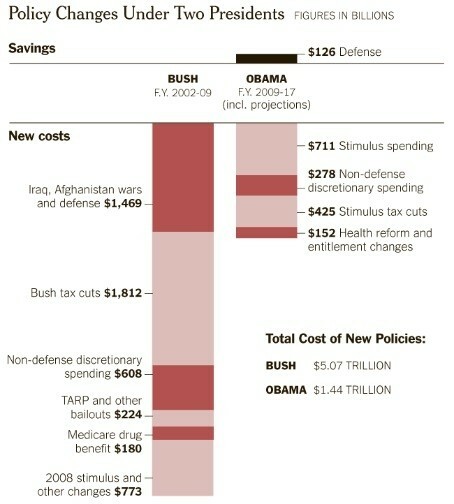 Obama vs Bush - who is responsible for the US deficit? The graph on the left is borrowed from the Washington Post and reportedly shows how the present US deficit and debt crisis has grown up. 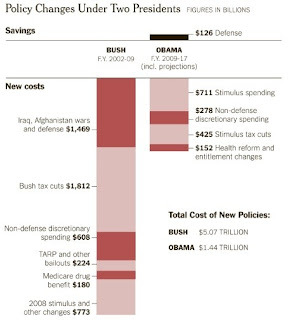 The Bush tax cuts didn’t just lower revenue for 10 years. It’s clear now that they lowered it indefinitely, which means this chart is understating their true cost. Similarly, the Medicare drug benefit is costing money on perpetuity, not just for two or three years. And Boehner, Ryan and others voted for these laws and, in some cases, helped to craft and pass them. I wonder how effective the Democrats will be in getting this message out to the American people. Whose DNA is driving this coalition? It is always difficult to establish the exact truth of what is going on in Government from early newspaper reports, but if this Daily Telegraph article is correct then Nick Clegg may be in for a rough ride at the Liberal Democrat Conference in September. Currently, in England and Wales, the DNA profiles of everyone arrested for a recordable offence are retained by the police, regardless of whether they were charged or convicted. This has meant that the police’s national DNA database holds more than five million profiles, including one million people with no criminal conviction. Experts say storing the DNA of innocent people gave them an unfair “presumption of guilt” in the eyes of the police. The Coalition agreement last May said the Government would “adopt the protections of the Scottish model for the DNA database”. DNA samples from innocent people would be deleted, apart from those accused of a sexual or violent offences, which would be held for five years. However, Home Office minister James Brokenshire admitted to MPs on a committee which is considering the legislation that police forces will retain innocent profiles. Mr Brokenshire said he had won agreement from the information watchdog that the DNA profiles could be retained by forensic science laboratories. This would mean that the profiles would “be considered to have been deleted (even though the DNA profile record, minus the identification information, will still exist)”. However Mr Brokenshire admitted that it would be still be possible to identify the anonymised profiles. A Home Office spokesman has insisted that profiles will be completely deleted from the national DNA database. However, as the paper points out, within individual police systems, profiles are recorded in batches and it is not possible to delete one without affecting the rest, including convicted offenders. The spokesman may be saying that the Government position has not changed and that they will retain the DNA of the guilty, not the innocent but from where everybody else sits that does not look to be the case. Either the Government needs to give us more detail as a credible reassurance or else they should rethink and keep the original promise. “No one should underestimate the cruel impact of TB in cattle or in badgers, and its emotional and economic effects on farmers, but any response must be based on science and the Government has failed to take on the advice from research conducted by the Independent Scientific Group (ISG). The ISG instead called for a more cattle focused approach to dealing with the spread of the disease which Adrian supports. The need for a cattle based approach is strengthened by estimates that badgers are only responsible for 30-40 percent of cattle TB. The reason for the spread and increase of the disease is instead more likely to be because of a relaxation of cattle testing, less regulation concerning slaughter and movement and an intensification of dairy farms. Adrian said “I regret that the Government have reached this decision which I believe will not have the desired results of stopping the spread of TB, but instead will lead to the loss of life of badgers and potentially other innocent creatures, such as domestic cats, if as a leading farmer in Devon has suggested armed groups will work at night. In fact there is evidence that farm cats may be susceptible to bTB, and may well infect cattle. It is not just badgers that pass on this disease, it will jump species randomly. It is for this reason that the most effective way to tackle this disease is through vaccination. You'd have thought this culling should do some good, or at least no harm. In fact, the "reactive culling" was stopped after a few years when the rates of cattle TB infections in these areas turned out to be higher than areas with no culling, by about 20%. One suggested explanation was "perturbation". Badgers live in small groups, with territorial boundaries; if you kill some, the groups are disrupted, and the animals wander further afield, spreading infections more widely. But the results from the "proactive culling" were more interesting. In the 100km2 culling zone, cattle TB infections fell by about a quarter. But in the 2km-wide "ring" around the proactive culling zone, the number of TB infections in cattle rose by about a quarter, perhaps, again, because of "perturbation". A 2km ring becomes less important when the culling area is larger, and mathematical modelling suggests that after 150km2, the extra TB infections in the ring are outweighed by the benefits in the cull zone. At this size, you prevent 23 of the 187 expected herd outbreaks, and so save £600,000 ( outbreaks each cost £27,000). The cost, however, using the cage-trapping method used in the trial, is £2.14m. This is why people concluded it wasn't worth the effort. Here is the second science bit. The government is now introducing a kind of farmer-led culling. This costs around £500,000 for the same size area, and so now a cull becomes cost-effective, by a hair. But we also end up several steps away from the scientific evidence. First, we're assuming that results from small cull zones scale up neatly into larger ones, and that killing can be done uniformly without local perturbation. But more importantly, the trial loses what evidence nerds call "external validity": the ideal perfect intervention, used in the trial, is very different to the boring, cheap, real-world intervention that the trial is being used to justify. Under the UK Government's current plans, the idea as I understand it is to licence individual farmers to cull on their own land. Unless there is 100% take-up then the outcome is inevitably going to be perturbation within the cull area and the spreading of bTB to previously unaffected areas. I would suggest that such an approach is even more prone to judicial review than the inept approach taken by the One Wales Government. There are some who interpreted my question yesterday as to whether Rupert Murdoch and his company are fit and proper people to own any media in this country as a call for censorship. Nothing could be further from the truth. My point was that in the current 24/7 news cycle those who own and control the media have great power and need to exercise that responsibly. They should not be allowed to misuse that power by seeking to subvert democratically elected politicians, bribe policemen and break laws with impunity as has happened. There needs to be a standard that all media should meet but that should not prevent genuine investigative journalism or even popularist muck-raking provided that sources are legitimate. Making threats to bring down elected politicians so as to further economic interests if, indeed that happened, in my view does not meet that fit and proper test. In other contexts it would be called blackmail, so why should it be any different for multi-millionaire media moguls? Vince Cable in today's Financial Times appears to agree. He says that companies that own UK newspapers should not be allowed to take control of broadcasters without thorough investigation. He said he would not pre-empt the inquiry by Lord Justice Leveson into phone hacking and the behaviour and influence of the press. Setting the boundary as to what is and what is not legal must be one of the outcomes of this whole process. Whatever the truth regarding reports in this morning's Observer that Rupert Murdoch's News International launched a campaign of bullying against senior Liberal Democrats in an attempt to force through the company's bid for BSkyB, it does illustrate one point. That is that whilst Labour and the Conservatives cosied up to Murdoch, the Liberal Democrats kept their distance and were lone voices in calling for his empire to be brought under control. The paper reports on briefings by Liberal Democrat insiders, who say that News International officials took their lobbying campaign well beyond acceptable limits and even threatened, last autumn, to persecute the party if Vince Cable, the business secretary, did not advance its case. They say that this chimes with reports from senior figures in the Labour party who say that Murdoch executives issued threats to Ed Miliband's office after the Labour leader turned on News International when the news broke that murdered 13-year-old Milly Dowler's phone had been hacked into by the News of the World. It is precisely these sort of tactics that raises questions over Murdoch and his company being fit and proper people to own any media in this country. The Americans may be content with Fox News setting the agenda and targetting individual politicians but such practises are anti-democratic and need to be stamped out. Nobody elected News International to anything and they are not likely to either. Plaid Cymru AMs and activists have already been on social networking sites to condemn this article in today's Western Mail as evidence that Matt Withers knows little 'about Plaid and Welsh politics' or even that it is 'inaccurate' and 'full of lies'. So clearly, some of it must be right. It is worth pointing out by the way that the article was written by Martin Shipton and not Matt Withers. Did Bethan Jenkins actually read it? A source said: “The party is in a worse state than it has been for many years. It’s four seats down and the Assembly group has lost leading figures like Helen Mary Jones and Nerys Evans. “Since the election in May there has been an exodus of staff, with people going on to jobs elsewhere. It has also emerged that rows are going on behind the scenes about the party manifestos – both for this year’s Assembly election and next year’s council elections. Another source said: “This year’s manifesto was a shambles and it was impossible for local members and branches to get any input to it. Simon Thomas [the former Ceredigion MP who was elected as a regional AM for Mid & West Wales in May] was tasked with writing it, but the manifesto that appeared was written very hurriedly by Rhuanedd Richards. The source suggested that Plaid’s deputy leader of Cardiff Council, Neil McEvoy, was bitterly opposed to the idea of a Wales-wide local government manifesto. Whatever the truth, there is no doubt in my mind that so far in the new Assembly term Plaid Cymru have been a shadow of their former selves, rudderless, dispirited and lacking in purpose. What is worse for them is that there does not appear to be a leader in waiting capable of putting things right. The Western Mail analysis of potential candidates is not that far off the truth at all. 1. Aled Roberts' first language is Welsh and most of the time he will work through the medium of Welsh. Obviously that will not be the case when he is working with a non-welsh speaker. The point remains therefore that it was perfectly reasonable and natural for him to access documents on the Electoral Commission website in Welsh and rely on their accuracy. 2. A bilingual society means that Welsh speakers can choose which language to work in. It is the role of statutory bodies to facilitate that. It does not mean that a Welsh speaker must only use that language. They are free to use whichever language is appropriate in the circumstances. That is why Labour complaints about Aled Robert are so bizarre. Notwithstanding the fact that three of his four contributions in the Chamber have been in Welsh, he is doing nothing differently to any other first language Welsh speaker. He is using the language he feels is most fitting to the occasion. The photograph shows a part of the manifesto being sent out by Lembit Öpik to members in London in pursuit of his campaign to be the Liberal Democrat candidate for Mayor. It contains an interesting view as to why he lost his Montgomeryshire seat. According to Lembit it was entirely due to the incident in which Mick Bates drunkenly assaulted a paramedic in January 2010, which became public two months later. As somebody who was campaigning actively in Wales during that election I was surprised by this view, as is everybody else I have spoken to since I saw it. What is most disappointing about this leaflet is that throughout the barrage of criticism that Lembit suffered in the years leading up to that election, Mick Bates stood by him as his most loyal ally. When nobody else had a good word to say for Lembit. Mick was defending him. Is this how he repays that loyalty? It does not bode well for his mayoral candidacy where he will be expected to unquestioningly support candidates all over London. There were a number of reasons why Lembit lost his Parliamentary seat. Chief amongst them was his self-obsessive and flamboyant behaviour and his loss of perspective. His response to the expenses scandal was considered inappropriate and insensitive and then there was this, a free six-day cruise around the Canary Islands, worth around £3,000, in exchange for giving two lectures to the 2,000-odd passengers at a time when Parliament was sitting. That issue was raised a number of times during hustings and in my view was the final straw for some people. It is possible that the Mick Bates issue influenced some people but it does not account for the eradication of a 7,000 majority. The loss of Montgomeryshire was down to Lembit alone. It is time he took responsibility for it. Mr Opik later disowned the manifesto paragraph which he says he had not approved. He said: "Having seen what Peter has seen I think he's justifiably angry. He'd be right to take a dim view of it if I approved that phrase and I haven't... I'd like to apologise to Mick. I personally apologise to Mick because this is unacceptable." Mr Opik said Mr Bates was "close to being a brother to me" and added: "From now on I won't allow anything to be published without me signing it off in writing." The new system was put in place last October following a series of scandals that resulted in two peers being jailed. The £174 overnight subsistence, £86.50 day subsistence and £75 office costs allowances were scrapped in favour of a tax-free flat rate of £300 per day, or £150 per half day. Travel expenses were reimbursed separately as previously. Unveiling the system, Lord Strathclyde, the Leader of the Upper House, said it would be “cheaper to run, less bureaucratic to comply with, simpler to police and far, far harder to abuse”. However, the figures indicated a rise in costs over the first six months of the scheme. Altogether, £5.86 million was paid out in attendance allowance between January and March this year. Another £531,000 was refunded for travel costs. Some of this increase in cost is down to the extra peers appointed by the UK Government. However, what it does illustrate in my view is that you cannot have a legislature on the cheap. What is important is that if members are going to be receiving public money in this way then they should be accountable for it. That is why it is essential that the Government's reforms are implemented quickly and we put in place a fully elected second chamber. Today's Independent carries an interesting article on passwords, including a list of the most common. The top choice it seems is 'password', which is startlingly predictable. But we're spectacularly unimaginative in our choice of passwords, and despite constant reminders that this represents a security risk, we blithely carry on using them, reassuring ourselves that we haven't been scammed thus far. But that's a bit like wandering blindfolded around busy town centres and saying: "Well, I haven't been hit by a car yet." But passwords will persist, not least because we're hugely resistant to anything more complex. Whenever the news features security breaches, from celebrity Twitter accounts to personal data leaks, weak passwords are often to blame. Our laziness in this regard is revealed in statistics that would be hilarious, if the implications weren't so serious. According to data gathered by Mark Burnett, author of the book Perfect Password, 98.8 per cent of us share the same 10,000 passwords. Many online security systems are built to withstand repeated incorrect guesses, but if they aren't, a computer could quickly zip through 10,000 attempts and gain access within a very short space of time. Nearly one in six people will look at the list below of the top 10 passwords and passcodes and recognise theirs instantly; it seems incredible that "password" is still the most popular password – but it is, with 123456 trailing close behind. "5683" might seem at first glance to be a pretty random passcode or PIN – but it spells out "LOVE" on the keypad, and that's as much of a gift to hackers as the ridiculously common password "iloveyou". These kind of careless, forehead-slapping mistakes are widespread within companies, too. The first is simply to ask us what it is. Social-engineering techniques can persuade us to give it up very easily – for example, via a rogue email purporting to be from a bank. The second is to have a guess, and as we've seen, 10,000 guesses will hit paydirt 98 per cent of the time. The last is brute-force cracking, where all the potential combinations are laboriously worked through until the right one is chanced upon – and that's where the length of password becomes crucial. Pop along to the website howsecureismypassword.net, tap in an eight-character password, and it'll tell you that a desktop PC can guess it in a matter of hours. But extend that to a 12-character password, and we're talking several centuries. I am relieved that when I put my current Assembly password into this website it said that it would take about 495 years for a desktop PC to crack it. That is not a challenge by the way and in any case I have just changed it. The First Minister (Carwyn Jones): No. Labour have been pretty vitriolic about the remuneration and bonuses received by the bankers in the light of banking crisis and the huge sums of public money that have had to be invested in financial institutions so as to keep them and the economy afloat. In doing so they have been reflecting the public mood, which is why the Government moved to tax the banks to the tune of £10 million over the next four years. Strangely though there has not been the same level of fuss from the brothers and sisters regarding another pay-off scandal, namely the golden goodbye payment to Derek Simpson, the leader of Britain's largest trade union, Unite, amounting to more than £500,000 last year, including a £361,000 severance payment. The fact that Labour received a £1 million donation from Unite during the 2010 General Election is completely unrelated to the relative silence from the offical opposition over this golden goodbye. I have just come back from the Royal Welsh Show where, as this item on the BBC website makes clear, the badger cull and bovine TB is still a major topic of conversation. "Four weeks have now passed by since the environment minister stood up in plenary to announce that an expert panel would peer review the scientific evidence base regarding the eradication of bovine TB in Wales. "NFU Cymru is extremely frustrated and disappointed that no further announcements have been made to date with regards to the make-up of the peer review group, the terms of reference and exact timescales to which the group will be working." I am not disputing any of that. My frustration is with the way that the farming unions seem to place their emphasis on the badger cull as the ultimate solution to this issue. Without going through all the arguments again, important as it is to prevent cross-contamination between species, the main thrust of any strategy to reduce and control bTB in cattle has to be through proper control measures. If anything the missing ingredient is a vaccination strategy both for cattle and badgers. Not only will a cull actually spread the incidence of bTB but it is also using a sledgehammer to crack nut. That is particularly so in England where farmers are apparently going to be licensed to wander the countryside shooting anything that looks and moves like a badger. We have seen positive signs of a reduction in bovine TB over recent months. It is too early to establish if this is a long term trend, and the impact of bovine TB continues for those farms suffering its consequences. It therefore can not justify a reduction in the existing measures in place to eradicate TB. During the review, the current regime of cattle surveillance and controls will continue. This includes the additional cattle disease control measures, introduced on the 1 May 2010, in the Intensive Action Area. There will be no badger cull in the Intensive Action Area while the review is being carried out. The Welsh Government remains fully committed to eradicating bovine TB and this review of the scientific evidence base will contribute to that objective. The farming unions are right that the review is not moving fast enough but they could also acknowledge that progress is being made, that the incidence of infection is currently falling and that what really needs to happen now is for the current control measures to continue and if possible, spread across the rest of Wales if they have not already. I was reminded yesterday of one of Gordon Brown's bigger gaffes as Chancellor of the Exchequer, the time when he sold off a huge chunk of the country's gold reserves at a rock bottom price. Wikipedia records that between 1999 and 2002 Brown sold 60% of the UK's gold reserves shortly before gold entered a protracted bull market, since nicknamed by dealers as Brown Bottom. The official reason for selling the gold reserves was to reduce the portfolio risk of the UK's reserves by diversifying away from gold. The UK eventually sold about 395 tons of gold over 17 auctions from July 1999 to March 2002, at an average price of about US$275 per ounce, raising approximately US$3.5 billion. By 2011, that quantity of gold would be worth over $19 billion, leading to Brown's decision to sell the gold being widely criticised. In 2007, the Times estimated that Gordon Brown's actions cost the taxpayer an estimated £2 billion. Last Thursday the price of gold reached its highest point of $1,590 per oz, around £985 per oz. Those 395 tons would have been worth much more now. If truth be told, today's lead story from the Independent on Sunday is disappointingly pedestrian. Despite all the hype the best the newspaper can come up with is that the the Conservative chairman of the Culture, Media and Sport committee is facebook friends with Elisabeth Murdoch and Les Hinton and that he has met some key figures in the scandal at social occasions. To be fair, if the Chair of the Culture Committee was not meeting major figures in the media, then he would not be doing his job properly. What he does need to do is to remain impartial and have no interests that would impinge on his neutrality. It is obvious from the published evidence that in that regard Mr. Whittingdale is in the clear. I can see no reason at all why he should not continue as Chair nor why he would not conduct a very robust interrogation of the witnesses on Tuesday. Writing in his Spin Doctor column in this morning's Wales on Sunday, Matt Withers returns to the issue of the 'Lib Dem two' with what he believes is a decisive parting shot. In actual fact the defence was that Aled Roberts chose to access the documents in Welsh because that is his first language, but that crucially he reasonably should have been able to expect the information available to him to be identical in both languages. That is what the law says and after all, if he had been a monoglot English speaker and it was the English which was wrong, then it would also not have been reasonable to suggest that he rely on the Welsh. However, as I sat through all of Aled Roberts' contributions to Plenary last week, something of what Matt Withers wrote did not ring true. Did Aled really deliver both of his speeches in English? According to the Record of Proceedings Aled Roberts in fact asked his question to the First Minister on Tuesday in Welsh, he asked two questions of the Education Minister on Wednesday in English and spoke in Welsh in the statement on an Estyn report and in Welsh in the debate on Public Sector Employment. Still, never let the facts get in the way of a good story. Is this the end of free prescriptions? The paper says that it is feared that other health boards, charged with saving up to £1m a week each, could follow suit, undermining the Welsh Government’s free prescription policy. Indeed the British Medical Association has already leapt in with both feet, describing the move as “immoral”. Their argument is that this policy is inducing GPs to break their terms of service. They say that GPs have an obligation under their NHS contract to prescribe those medicines they think are necessary for the patient’s treatment and that the health board is exceeding its remit in seeking to restrict that. For the defence the health board argue that money spent on “cheap-to-buy” remedies is better used for treating more patients with more serious conditions. I suppose it really depends on what is on the list. If it is items such as painkillers or hay fever remedies then I don't see the problem. The free prescription regime was designed to deal with medicine that would have been prescribed when it cost the patient £6 or so per item, not to introduce a free-for-all at the chemist or create queues at doctors' surgeries for those who wanted free access to relatively cheap and easy to obtain medicine. Were we really aiming to increase the number of packets of paracetamol that were dispensed by 268,000 between2006 and 2010? Can we justify a 10% rise in prescriptions for athlete’s foot powder? Certainly, if the reaction of their spokesperson is anything to go by, the Welsh Government is fairly relaxed about the proposal. They say that determining what medication is given on prescription is a matter for the prescriber. That looks like a green light to me, unless there is activity going on behind the scenes that we do not know about. This morning's Independent seems very keen to challenge Gordon Brown's version of events regarding his premiership and News International. They say that former members of Gordon Brown's Cabinet have questioned his claim that he wanted to launch a judicial inquiry into phone-hacking while he was prime minister. Whilst the ex-Prime Minister's claim that his proposal was blocked by the civil service was rejected by Gus O'Donnell, the Cabinet Secretary, who argued that he could have overruled his advice. As the former prime minister sought to rebuff Tory claims that his government had failed to stand up to Rupert Murdoch's empire, he told MPs on Wednesday that he had tried to launch a public inquiry in February last year. Mr Brown said: "It was opposed by the police, opposed by the Home Office and opposed by the civil service and it was not supported by the [Culture] Select Committee." Another said the idea never got past first base because a hacking inquiry would have looked like a "revenge attack" on News International after The Sun deserted Labour and switched its support to the Conservatives the previous September. "It would have backfired on us badly. It would have been seen as nakedly party political on the eve of a general election," the ex-minister said. Former Cabinet members said it was Mr Brown's decision not to pursue the inquiry. "He could have driven it through the machine if he had really wanted it; he was the prime minister after all," one said. Sir Gus took the unusual step of releasing the memorandum he submitted to Mr Brown last March. In it he concluded it was "doubtful" an investigation was justified under the Inquiries Act 2005 and could have been challenged in a judicial review – especially if it covered the media in general. A tighter remit covering only the News of the World "could be deemed to be politically motivated" in the run-up to an election, the memo said. "He got it entirely wrong," Mr. Murdoch said, adding that "the Browns were always friends of ours" until the company's Sun tabloid withdrew its support for the Labour Party before the last election. No matter how hard the Labour Party try to put distance between themselves and this scandal, it seems destined to keep coming back to bite them. The Daily Telegraph contains the sort of article today that normally one would expect to see in the News of the World. They record that the Department of Communities and Local Government, who are in charge of housing and local neighbourhoods in England, paid £4,719 to hold a team-building session at the Brickhouse burlesque club in the east end of London last May. No phone was hacked to obtain this information, indeed it came from the more traditional route of a parliamentary answer. In addition the responsible minister has insisted that no one "watched burlesque chanteuse Lady Beau Peep". Mr Neill explained, however, that while the event had taken place in a venue associated with scantily-clad dancers and hedonism, no alcohol was drunk. He added: "The event involved hire of a room during the day at the venue, for a review of work in internal audit. "While I am informed the Brickhouse often features such figures as 'burlesque chanteuse Lady Beau Peep' and 'showgirl sensation Amber Topaz', the event in this instance did not involve civil servants watching, or indeed, performing cabaret or other eclectic entertainment." It is most probably best to make our excuses and leave rather than have details of the team building exercises but do not worry, according to the Minister it was all the fault of the last government. Kirsty Williams' initial reaction to the Welsh Government's legislative statement yesterday, that a bill to force joint appointments in local government is reorganisation by the back door is in my view, absolutely correct. As Kirsty said, if the government want to reorganise local government then they should say so and publish a white paper setting out proposals so as to start the debate. The First Minister responded that the Government did not want to do this because of the cost of reorganisaton, which is a valid point of view but it does not address the fundamental problem that his Minster is flailing around wildly trying to look macho whilst failing to adequately deal with the issue. The point is that collaboration between organisations is a complex and difficult process that involves buy-in from both sides. It is not something that you can impose by threats. Joint appointments may sound attractive but as a means of collaboration they are superficial, whilst at the same time putting the appointee in an impossible situation. Without a joint structure beneath it, the combined post will be isolated and torn between competing demands on his/her time. Where they have been succesful they have been set-up on the basis of an agreed method of joint working such as in Gwent, Pembrokeshire or Bridgend and they have involved organisations outside the local government family such as health. There is no indication at all that the government are prepared to compromise their own control of directly funded services by putting a similar duty on health boards for example. This is control freakery of the worse kind. That the Minister thinks he can proceed in this way shows a shocking ignorance of the area he has responsibility for. Collaboration is widespread in local government, though it can be better and they can do more of it. However, the way forward is to incentivise and support such joint-working, get other government departments to commit to it as well and look at removing any legislative barriers. Carl Sargeant's problem is that he is wielding a sledgehammer within government silos, not breaking down the walls of those silos. The decision by the banks to abandon plans to scrap cheques is very welcome but is there a bit of smoke and mirrors going on as well. The Financial Times reports that the controversial plan was scrapped after banks were warned in parliament that they had “scared the pants off middle England”. They say that worried members of the public sent more than one thousand letters and emails to MPs after it was announced that the 350-year-old payment system was to be phased out by late 2018. The final straw for the banks appear to have been when the government indicated it would intervene unless a suitable alternative was found. This change of heart is particularly significant for the hundreds of small businesses who were concerned that the removal of cheques would drive up their costs and end up putting them out of business. It means that those small businesses and tradesmen who rely on cheque payments can now be sure of their future. However, as an individual who uses cheques when necessary because I do not trust internet banking, and also to buy certain goods and services, there is an additional obstacle, whose significance has not come fully to the fore. This is the allied decision not to allow debit cards to be used to guarantee cheques anymore. What this effectively means is that the use of a cheque as currency has been undermined and it is possible that it will whither on the vine anyway. I have just found this Comment is Free article by Peter Mandelson from yesterday in which he says that Labour were cowed from refroming the media because they were too fearful to do otherwise. Now they have to ensure that it is not primarily they who are protected from the "feral beast", but the public. This requires not statutory regulation but a robust, independent process to enable individuals to make right the falsehoods that slip through, or slander that sometimes gets pumped out by news rooms in the name of "press freedom". There is now consensus that the vehicle for self-regulation, the Press Complaints Commission, is not fit for purpose. I would qualify this view by suggesting that, for example in cases involving allegations of harassment and protecting children, the PCC does a good job. Its present top team is a marked improvement on predecessors. But when it comes to respecting the privacy of public figures and individual members of the public, the system of self-regulation has been used largely to protect the self-interest of the PCC's most powerful members. He puts forward five ideas to reform the Press Complaints Commission but in my view, has missed the public mood. None of these changes provide the teeth that a reformed Commission needs. By all means opt for self-regulation rather than government-led action but if we are to have confidence in such a body then it needs to be seen to be taking decisive action and it must have the ability to come down hard on transgressors. The constant stream of revelations coming out on a daily basis about telephone hacking are both astonishing and distressing. The idea that any newspaper might consider it to be acceptable to tap into the phones of the victims of quite horrific crimes is difficult to comprehend. The public may have shrugged their shoulders when they heard of celebrities and politicians falling foul of these tactics, but nobody is going to tolerate the outrageous behaviour of News International journalists and others as it has unfolded in the last week. The company and its media outlets have lost public support and may find their reputation damaged beyond repair. He noted that this was a ''particularly difficult time'' for Scotland Yard but said he did not know who carried out the hacking. Former Metropolitan Police commissioner Lord Blair told the committee his home and mobile telephone numbers were found on lists obtained by detectives investigating phone hacking at the News of the World. It seems that the audacity of the relevant journalists was unlimited and that even the Police cannot be protected from this outrage. If today's Independent is to be believed the old adage that revenge is a dish best served cold could well be applied by the Murdoch news empire to those they blame for their present problems. Rather bizarrely these victims may not include members of their own staff who have responsibility, either directly or managerially for the illegal and immoral behaviour that has so outraged the British public. The Independent understands the warning was made to a Labour spokesman hours after Mr Miliband had called on Wednesday for the resignation of News International's chief executive Rebekah Brooks. Three days later, The Sun carried a story claiming that Mr Baldwin had been a heavy user of cocaine. Yesterday, The Sunday Times carried a story which said he had been accused – in a previous job – of hiring a private investigator to "blag" the bank details of the Conservative donor Michael Ashcroft. Mr Baldwin denies the claims. The broad theme of both allegations had been made in a book by Lord Ashcroft, which was published five years ago. He repeated the allegation surrounding Mr Baldwin's use of private investigators on Friday last week on the website Conservative Home, which he owns. The Labour leader must be hoping that the days of News International influencing the outcome of General Elections are over, but nevertheless must feel some unease at the uphill struggle that faces him. My judgement is that it will not matter. If anything the stance taken by the Labour leader (and hopefully the Liberal Democrats as well) will actually help him with the electorate. However, the next General Election will be decided on the economy and who the voters consider is best able to handle it. How press coverage of Ed Miliband impinges on that choice has yet to be seen. Jonathan Calder has already cornered the line that the News of the World has made its excuses and left, however that is clearly not the end of the matter. Wherever one looks today everybody is talking about the newspaper and the phone-hacking saga that centred on its offices but is apparently not the sole and exclusive preserve of that title. From behind its firewall, the Sunday Times claims that at least nine journalists and three police officers could be jailed in connection with the News of the World phone hacking scandal. If they have committed a crime then that would be the appropriate way forward. Of equal interest is the political fall-out. The Observer focuses on the judgement of David Cameron in hiring former News of the World Editor, with the claim by Paddy Ashdown that he had warned No 10 only days after the general election of "terrible damage" to the coalition if he employed Andy Coulson in Downing Street. They also say that Deputy Prime Minister, Nick Clegg received similar briefings to those given to Ashdown before the election, which he raised with Cameron, only to be rebuffed by the prime minister, who insisted that it was right to give Coulson a "second chance". However, if Ed Miliband thinks that he has an easy target in Andy Coulson's links with the Prime Minister, he needs to think again. Tony Blair and Gordon Brown of course, notoriously courted Rupert Murdoch, but more damaging is the leaked e-mail revealed by the New Statesman in which Ed Miliband's director of strategy, Tom Baldwin, warned Labour spokespeople to back off on the affair. The circular, sent by a Labour press officer on 27 January, states: "Tom Baldwin has requested that any front-bench spokespeople use the following line when questioned on phone-hacking. BSkyB bid and phone-tapping . . . these issues should not be linked. One is a competition issue, the other an allegation of criminal activity." It goes on: "Downing Street says that Cameron's dinners with Murdoch will not affect Hunt's judgement. We have to take them at their word." Referring separately to the phone-hacking allegations, the memo states: "We believe the police should thoroughly investigate all allegations. But this is not just an issue about News International. Almost every media organisation in the country may end up becoming embroiled in these allegations." It adds: "Front-bench spokespeople who want to talk about their personal experiences of being tapped should make it clear they are doing just that – speaking from personal experience." The guidance concludes with the warning, "We must guard against anything which appears to be attacking a particular newspaper group out of spite." There is no room for moralising politicians in this affair. As David Cameron said yesterday, they were all in it together. What needs to happen now is action to punish wrongdoers and install safeguards to ensure that abuse does not reoccur. Whether that happens is the real test of how sincere all of the politicians are being in their condemnation of the hacking activity. I have already expressed my concern at the process of fracking, proposed for the Vale of Glamorgan and Maesteg as a means of extracting natural shale gas. The process works by injecting fluids under high pressure deep underground to deliberately blast apart the gas-bearing rock. In Lancashire there have been two minor earthquakes centred on the area where this activity is underway. “Surface soil concentrations of sodium and chloride increased 50-fold as a result of the land application of hydrofracturing fluids…” These elevated levels eventually declined as chemical leached off-site. The exact chemical composition of these fluids is not known because the chemical formula is classified as confidential proprietary information. There really does need to be a propoer investigation into this process before it is allowed to start in South Wales. Frankly it was a bit of a shock to discover that Adolf Hitler has been an honorary citizen of his town of birth for the last 78 years, so the decision of Braunau council in Austria to withdraw the honour is welcome, though significantly overdue. The Guardian tells us that Hitler was actually born in the tiny village of Ranshofen, next to Braunau, and became an honorary citizen in 1933. Ranshofen became part of Braunau a few years later and thus Braunau is universally recognised as Hitler's birthplace. They add that local historians say they aren't sure if the title was transferable, but the town council decided to abolish it, just in case. Some might argue that such an act is irrelevant 66 years after the dictator's death, but the symbolism is important. The question has to be, why did they take so long? Make no mistake, if the Liberal Democrats actually won the election – or held the balance of power – it would be the first time in decades that Murdoch was locked out of British politics. In so many ways, a vote for the Lib Dems is a vote against Murdoch and the media elite. I remember in my first year asking if we staffed the Liberal Democrat conference. I was interested because as a student I'd been a founder member of the SDP. I was told we did not. We did not send a single reporter for fear of encouraging them. So while we sent a team of five, plus assorted senior staff, to both the Tory and Labour conferences, we sent nobody to the Lib Dems. And while successive News International chiefs have held parties at both those conferences, they have never to my knowledge even attended a Lib Dem conference. It gets even worse. While it would be wrong to say the Lib Dems were banned from Murdoch's papers (indeed, the Times has a good record in this area), I would say from personal experience that they are often banned – except where the news is critical. They are the invisible party, purposely edged off the paper's pages and ignored. But it is worse than that, because it is not just the Murdoch press that is guilty of this. The fact is that much of the print press in this country is entirely partisan and always has been. All proprietors and editors are part of the "great game". The trick is to ally yourself with the winner and win influence or at least the ear of the prime minister. The consequence of this has been that the middle party has been ignored, simply because it was assumed it would never win power. After all, why court a powerless party? So it isn't that we have been paranoid about the media ignoring us, they really were. Heve things really changed since we went into government? I am not so sure. Greater self-love hath no man than this, that he should lay down the careers and livelihoods of hundreds of innocent staff in a desperate attempt to salvage his own business interests and those of his media empire. Today's Telegraph reports that information relating to every corner of public services, National Health Service, schools, criminal courts and transport will be published for the first time. They say that members of the public will be able to see clear and revealing data online in what Whitehall sources admit is a “risky” political strategy, but one which Mr Cameron says will enable the public to hold the public sector to account. The Prime Minister added: “With our new plans, you’ll be able to drill down into the performance of individual schools, checking their exam results by subject area, absence rates and the quality of teaching. Our aim is to provide similar information on performance right across our public services. “So now, you’ll be able to compare the health outcomes of individual GP practices and hospital departments. “You’ll be able to see not just what crimes have been committed on your street, but what action the police have taken. You’ll also know about congestion on local roads and delays on your railway line. “And in all these areas, the data will be updated regularly,” he said. Whitehall sources say that clinical audit data will show which GPs have never diagnosed a case of cancer, for example. The figures will be available from December. Information about individual GP practices will also be made available with patients able to judge medical centres against 22 indicators. But ministers believe that the “crown jewel” of the plan is the national pupil database. That will help parents and pupils monitor the performance of their schools in depth from June next year, allowing meaningful comparisons of school performance to be made. In transport, passengers will be able to access rail timetable information after ministers won a battle to get weekly data from National Rail published from December 2011. Will the Welsh Government be brave enough to follow suit? The Badger Trust have issued a press statement in which they say that a report published on Monday by a panel of experts confirms that a badger cull would be a massively irresponsible gamble that could backfire on farmers and prove hugely unpopular with the public. They say that: "The forecast possible reductions in bTB are small and spread over a huge time frame - nine years until 2020. They are also highly speculative, relying on a large-scale, sustained, simultaneous cull over a large area. They are also, damningly, based not on science but on guesswork. "The impact and efficacy of shooting free-running badgers - many of which will inevitably be wounded - is based not on hard proof but on supposition because shooting has never been tried before. Perturbation is known to have a major negative effect on culling effectiveness but the Government, in its haste to unload costs on to farmers, is ignoring that key fact. It was clear from the minutes of the DEFRA science meeting released on 4 July that one cannot reliably extrapolate from the RBCT results if one takes a significantly different approach to their methodology, as appears to be planned by DEFRA. Even following the RBCT methodology closely, the benefits are miniscule and the process is costly. The group concluded that vaccination was effective and had none of the negatives of culling." It has been a really important day, mostly dominated by the vote later this afternoon on whether to reinstate Aled Roberts to the Assembly. However, whatever happens in that vote the important decisions that need to be taken for Wales will be outside of the Senedd. These decisions are foreshadowed by Carwyn Jones' meeting today with the Chancellor of the Exchequer regarding the Barnett formula and the forthcoming Calman-style review of the way that the Assembly is funded and related tax issues. There was a debate on a cross-party motion in the Assembly yesterday which will hopefully demonstrate solidarity on these issues to the Treasury. Next week the UK Cabinet meet in Cardiff and the Prime Minister will be addressing the Assembly. Let us hope that it is good news, that the Barnett floor, guaranteeing a certain level of funding, is agreed separately and that the terms of reference for the review are as wide as possible. It is time the Assembly took responsibility for its own budgets and that means introducing greater fiscal accountability for the Welsh Government, as well as giving them the tools to influence the Welsh economy. Those are the really important decisions that will be taken over the next few weeks. I have to say that everytime I go into the BBC offices in the Welsh Assembly they are all hard at work and not all of them have tidy desks. However, according to this morning's Western Mail all of this could just be an illusion put in place to fool me and other visitors. A whistle-blower who works at Broadcasting House in Cardiff claims that bizarre BBC rules have made it too expensive for many programmes to use staff journalists who have spare capacity over the summer. Last night the BBC acknowledged the authenticity of a manager’s internal e-mail leaked to the Western Mail that appears to back up the claim, but said the controversial rules would be contributing to 15% production cuts over a five-year period. Like other politicians I will be too busy over the recess of course to be able to check. I will need to rely on the Western Mail and their source for updates. As I blog daily and given my interest in civil liberty and privacy issues, it would be strange if I did not comment on this morning's Guardian news item that the News of the World hacked into Milly Dowler's voicemail after she went missing. The messages were deleted by journalists in the first few days after Milly's disappearance in order to free up space for more messages. As a result friends and relatives of Milly concluded wrongly that she might still be alive. Police feared evidence may have been destroyed. This is a new low even for the News of the World. I would expect the Police to take the appropriate action but surely it is now time for the Government to step in to strengthen legislation and safeguards against this sort of activity. Labour Leader, Ed Miliband owes his election to the Trade Unions and yet felt obliged to condemn their recent day of action on pensions. A number of Labour politicans have denounced in trenchant terms Coalition Government policies on welfare reform, the economy, schools and the NHS and yet when it comes to the detail of these reforms, Labour frontbench spokespeople offer support for the general direction of travel. Even on the deficit it has emerged that plans by the last Labour Chancellor of the Exchequer were comparable with action by George Osborne and in terms of Wales, revenue cuts would have been worse, whilst cuts in capital expenditure would have been faster and deeper. Treasury figures published at the time of Alistair Darling’s 2009 Budget indicated an intention to cut the Welsh capital grant by 45% over three years, while the Conservatives and Liberal Democrats are cutting the same grant by 41% over four years. If I am confused as to what Labour stands for anymore then it is hardly surprising that voters are also questioning why they should support them. The Spectator blog appears to have the same issues. This wasn't an attack on the idea that British workers are losing out in the great, globalised labour market. This wasn't even an attack on the specific of IDS's welfare reforms. It was an attack on the coalition's immigration policy, which, Cooper suggested, isn't matching up to the hardline rhetoric. More should be done, she said, to curb illegal entrants. There should be more controls. This was, it soon became clear, quite something from a Labour politician: a broadside against IDS from the right. And the broadsides continued, from the same direction, when the questions moved onto asylum seekers, imprisonment, and the like. Clearly, Cooper has been talking to her constituents, but you won't find that many Labour activists who would agree with this approach. It is little wonder that Ed Miliband is struggling to find a narrative. Update: another example of Labour saying one thing and doing another is over housing benefit. As I said in a previous post the government need to revisit the proposed £500 a week cap on these payments. That is not to say that they should get rid of the cap altogether but make it more flexible to take account of high rent areas. Housing Benefit will be reformed to ensure that we do not subsidise people to live in the private sector on rents that other ordinary working families could not afford. Isn't that the onjective of UK Coalition policy? This morning's Observer revelations that even Eric Pickles thinks that the proposed £500 cap on welfare benefits is set at the wrong level must cause the Prime Minister to pause and reflect. ■ 40,000 families will be made homeless by the welfare reforms, putting further strain on services already "seeing increased pressures". ■ An estimated £270m saving from the benefits cap will be wiped out by the need to divert resources to help the newly homeless and is likely to "generate a net cost". ■ Half of the 56,000 affordable homes the government expects to be constructed by 2015 will not be built because developers will realise they will not be able to recoup even 80% of market rates from tenants. I suspect most of the impact of these reforms will be felt in England, where property values are greater, but there is no doubt that some in Wales will also be affected. There is still time to reconsider this cap and I hope that the Government do so. Certainly, if I was in the House of Lords I would be seeking to table amendments to this legislation and I hope that the Liberal Democrat peers do so. This morning's Guardian contains the latest installment of Alistair Campbell's diary in which he details the full extent of the political interference in Government by the Prince of Wales. • Made "deeply unhelpful" interventions during the foot and mouth crisis in 2001. Campbell wrote on 16 March 2001: "TB said he knew exactly what he was doing. He also asked whether Charles had ever considered help when 6,000 jobs were lost at Corus [the steel manufacturer]. He said this was all about screwing us and trying to get up the message that we weren't generous enough to the farmers." • Boycotted a banquet in 1999 for Jiang Zemin, then president of China, a decision criticised by Blair as "silly". In a long paper to Blair the prince wrote: "I feel very strongly about it." • Challenged Blair on plans to outlaw foxhunting. In what Campbell described as a "long note on hunting" in late 1999, the prince said it was good for the environment. • Declared in the same note that hereditary peers, the majority of whom were abolished by Labour in 1999, had much to offer. Campbell wrote that the prince had said "menacingly": "We don't really want to be like the continentals, now do we?" • Insisted that he had to speak out about GM foods after Downing Street had made clear its unhappiness with what Campbell describes as a "dreadful" Mail on Sunday article. In the same note to Blair the prince wrote: "I cannot stay silent." Campbell said Blair was furious with the prince's Mail on Sunday article in May 1999. "He was pretty wound up about it, said it was a straightforward anti-science position, the same argument that says if God intended us to fly, he would have given us wings. It certainly had a feel of grandstanding." Campbell writes that Blair thought the prince had a political agenda because he was upset by the former prime minister's speech to the Labour conference in October 1999 in which he attacked the "forces of conservatism". He wrote on 1 November 1999: "TB said he bought the line that because we were modernising, that meant we were determined to do away with all traditions but he had to understand that some traditions that did not change and evolve would die. It all had the feel of a deliberate strategy, to win and strengthen media support by putting himself at arm's length from TB and a lot of the changes we were making." It is difficult to know if the Prince is still behaving in this way but if he is it is unacceptable. Charles has a privileged job which enables him to access and influence the highest levels of government. However, he is unelected whereas they have a democratic mandate. He should not abuse his position by seeking to second-guess the electorate. So far in the debate, we have missed a crucial point. We have just focused on the cost of the monarchy, but our sovereign represents the greatest institution in our land; it is that bit that makes us British, and we do not want a mean monarchy. We want a proper and well-funded monarchy, not a bicycling monarchy, even if riding the Mayor of London’s bicycles. The subject of this debate encapsulates the connection the monarchy gives us to our history. What did the Commons spend its time debating in the 16th century? It spent its time debating that the King should live of his own: that the King—Henry VIII for much of that era—should be able to use his own resources to provide for all he needed to spend. This debate returns us to that same principle. The Crown Estate provides an extraordinary link with our history. We could probably find some acre of the Crown Estate somewhere—probably in Somerset—that was the property of Alfred the Great, but we would certainly find that there was property in the Crown Estate that came with William the Conqueror and from the dissolution of the monasteries. St James’s palace started as a leper colony founded by Queen Margaret in, I think, 1118. It was then part of the endowment of Eton college, which was, very tactfully, given back to the Crown by Eton when Henry VIII said, “If you don’t give it back, I’m going to dissolve you.” [Interruption.] That was a missed opportunity, I think some on the Labour Benches are saying. The Crown Estate is an extraordinary link with our history, which is what makes us the country—the United Kingdom—that we are. Some attack that and say, “We want a good value monarchy.” That makes Her Majesty sound as though she is something to be bought off the top shelf at Tesco, and it really cannot be how we wish to approach our constitution. The Crown is an essential element of that constitution; everything of importance that happens is done in the name of the Crown. Paul Flynn said that he wanted the royal family to be treated as any other family but, as my hon. Friend Michael Ellis pointed out, if they were any other family they would not be paying such a high tax rate. Given the 15% provision, Her Majesty will be expected to pay an 85% tax rate, which is more than the 50% tax rate that many of us hope will go over the course of this Parliament. Over the years we were kept in ignorance of the royal tax rates and it was only as a result of a campaign in this House about 12 years ago that we were given any information at all about this. I would welcome it if the hon. Gentleman is asking for full transparency on the royal taxes, but I am not sure that that is part of the suggestion before us today. I clearly have not asked for full transparency on the royal tax affairs. Indeed, I would argue for the precise opposite, because I do not think it is particularly sensible to be investigating in close detail how the royal family spend their money. I recall a line about motes and beams; we have had quite a problem with our own expenditure in this House and I am not sure that we have got things entirely right. Before we start criticising the monarchy and looking over every biscuit that the Queen buys, we should make sure that we have our own house in order. The hon. Gentleman would not be suggesting that a way of controlling the royal household would be to have the Independent Parliamentary Standards Authority running it, would he? I would most certainly not be recommending that IPSA comes anywhere near our sovereign. When the Crown Estate was granted in 1760 by George III, at the same time as he gave up his claim as King of France, the monarchy was in deficit and it needed extra money to fulfil the functions that were being fulfilled. Some of those functions were greater than those now paid for by the civil list. That is all certainly true, although Parliament would vote excess resources to pay for things such as the Army, so my hon. and noble friend John Thurso was not entirely fair on the point about paying for the Army. Now the Crown Estate is in substantial surplus and I think that the Chancellor, in his proposals, which in many ways are very good, may be being somewhat canny, because the next sovereign would be able to cancel this arrangement and say, “I should like £200 million a year, thank you very much.” There is no requirement on a new sovereign to agree to hand the Crown Estate over in return for a civil list. Mr Jones said that this is taxpayers’ money and not the Crown’s money, but it really is the Crown’s money because, on becoming King, the Prince of Wales or any other sovereign could simply rescind the agreement and claim it back. The Crown Estate is the sovereign’s property, which the sovereign gives to Parliament to help to pay for the costs of the nation; it is not taxpayers’ money that is being handed over. As a result of what I have described the Queen is paying a higher rate of tax than anybody else. We should remember that and I hope that the Chancellor will be generous. I would like the 15% provision to be increased because we want to have a glamorous monarchy that befits the status of our nation. We are a great nation, a noble nation and a nation that has had power across the globe in the past. We have one of the finest histories of any country in the world. When I see the coronation coach being pulled through the streets of London, I want to see it being pulled by the finest horses that money can buy and I want to see it gilded with the finest gold that can be bought. I want Her Majesty to have as a jubilee present the finest window that can be funded by Members of Parliament. That is the status of monarchy that we want and I urge the Chancellor to remember that. Even though I know that we are in this time of austerity, that we are all in it together and that the Opposition spent all the money, maxed out the credit card and so on, we should look after Her Majesty. Mr. Rees-Mogg is an institution in his own right!